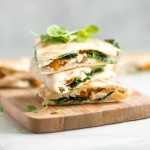 These fall-inspired butternut squash quesadillas with kale and chicken are the perfect answer when looking for a quick weeknight fall meal. And if you haven’t discovered the combination of butternut squash and kale together, then you are in for a delightful treat! Preheat oven to 425 F. Place cubed butternut squash on a lined baking sheet and drizzle with 1 tablespoon olive oil. Sprinkle on garlic powder, onion powder, cinnamon, 1 teaspoon salt, and pepper, then toss to combine. Roast until squash is tender and lightly browned, about 15-20 minutes, then remove from pan and set aside. On the same baking sheet, add kale, remaining 1 tablespoon olive oil and 1 teaspoon salt. Toss to combine, then roast for 7-9 minutes, or until kale is crispy. To prepare the quesadillas, lay tortillas out on a large cutting board. Spread 1 oz. of goat cheese (about 1 and 1/2 tablespoons) on half of each tortilla. Layer the cooked butternut squash, kale, and pulled rotisserie chicken on top, dividing equally amongst the tortillas. Top with 1 oz. mozzarella cheese on each tortilla, then fold the tortilla over to seal. Heat a large griddle or skillet over medium-high heat. Coat with nonstick spray then cook quesadillas until cheese has melted and tortillas are lightly browned, about 3 minutes per side. Cut into wedges, garnish with herbs if desired, and serve immediately. Double the recipe if you want lunch prepped and ready to go for the week because these reheat amazingly well!